One of the keys to a good spin is ending where you want to. A spin that ends cleanly looks good. Conversely, a spin that finishes with the dancer frantically searching for their partner looks uncontrolled, no matter how good the spin itself was. 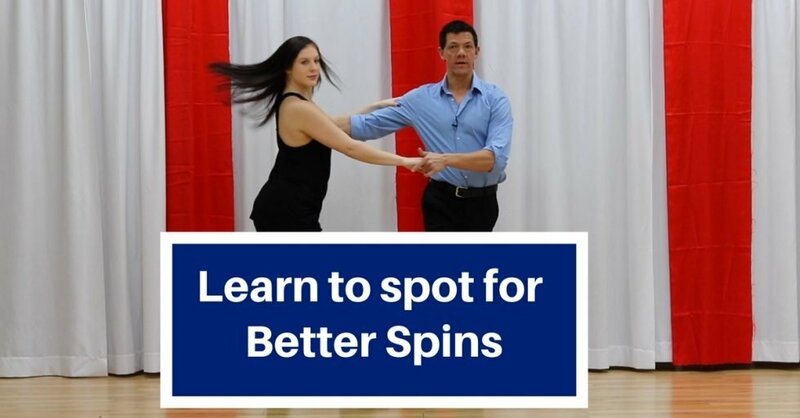 We’ve got a drill for you to spot for cleaner spins in general. While it’s possible to create a clean exit without spotting, it’s a lot easier when you do spot. As you increase the number of turns, spotting ensures that you have a consistent reference point throughout the turn. Ultimately, whether you choose to spot or not is an artistic decision that you can make as a dancer. However, you should be technically able to spot so you can make an informed choice about how spotting looks in your dance. Even if you think you will never spot while dancing, mastering the mechanics of spotting will strengthen your control during spins. The Drill: Stand in front of a mirror. Look at yourself in the mirror, and slowly rotate your body while keeping your focus on your mirror image. As you start practicing, shuffle your feet to rotate your body at a slow but consistent rate; when the spotting mechanic becomes more natural, you can shuffle less and rotate on your supporting leg. At some point, you won’t be able to keep focusing on your mirror image without tilting your head. When this happens, turn your head quickly so that you are now looking over your other shoulder to find your mirror reflection. You may not be able to get your head all the way around to see your reflection yet, and that’s okay. The point is to be looking for your reflection so your gaze can stabilize on that point while your body finishes rotating. Spotting is a little like rubbing your belly while patting your head: you are trying to do two separate motions at the same time. Your body is rotating at a constant, slower speed; your head is stationary for as long as possible and then rotates around much faster than the body until it finds the forward position and then becomes stationary again. Becoming fluent at these two motions together takes time, so keep practicing until they are instinctive. You can easily get dizzy by practicing a lot of spotting at once, especially if this is a new technique for you. Fortunately, spotting drills work really well when done in small bursts several times a day. If you do a couple of spots in the bathroom mirror every time you visit the restroom, you can get lots of repetitions without overwhelming yourself. Find micro-practices like this throughout your day: spot your computer monitor for a couple of rotations while waiting on the phone, spot your TV a couple of times during each commercial break, etc. Before long, spotting will feel very comfortable! Hey I wanna give you something for FREE! Some weeks it’s a pattern, some weeks it’s a technique tip, but either way its something about WCS that you’ll LOVE!